This is a Textile. It was manufactured by NUNO Corporation. It is dated 2009 and we acquired it in 2009. Its medium is 100% silk (raw silk and kibiso) and its technique is plain weave with paired warps. It is a part of the Textiles department. 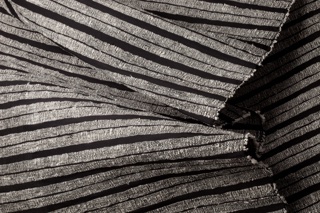 Kibiso Stripes is part of a series made from kibiso and raw silk by the Japanese textile company NUNO. The combination of these two materials reveals a very rich texture, structure, and surface design. Kibiso, an industrial waste product, is the protective outer layer of the silk cocoon that is “wiped off” and discarded in order to reach the finer silk fiber underneath. Consisting of sericin and other amino acids that ultimately help to protect the silkworm, kibiso has been used by other industries in such products as foods and cosmetics. Kibiso Stripes is one of the results of NUNO’s experimentation with upcycling kibiso—using the waste product to make something of greater value, such as textiles that filter UV rays and natural moisture. These qualities make the textiles in the series eco-friendly and sustainable.